Whether you are new to jet skiing or looking for ways to add some fun or functional gear, having the right accessories for your Waverunner can only make the riding experience more enjoyable. While there are certainly a lot of options on the market today, it’s best to narrow it down to the more essential. Let’s take a look at the top 10 must-have Waverunner accessories every rider needs out on the water. Life jacket: When looking at the most important Waverunner accessories every rider needs, a life jacket is the top choice for good reason. A life jacket keeps you safe from accidental drowning in the event you are incapacitated or unable to swim on your own. It is also usually required by law in most states for both the driver and any passengers. 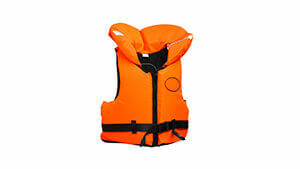 The good news is that there are plenty of life jacket choices on the market to meet your preferences. From options designed to minimalize bulk or improve buoyancy, there are endless options in a range of price points to help you find the right one for your riding needs. Dock line: As any jet skier already knows, having a reliable dock line is important, especially since water can easily float your ride away if you don’t properly secure it. There are two main choices for dock line with one being marine rope and the other being a bungee cord style dock line. There are benefits to each one. A marine rope is more affordable in general and you can tie it in different knots. A bungee cord option has more give to it which can be ideal when dealing with choppy water to avoid pulling on your ski with too much force. You can always try out both and see which one you prefer for your docking needs. Waterproof speakers: This is one of the Waverunner accessories every rider needs simply because it adds to the fun! Waterproof speakers let you play music while out enjoying a ride without the worry of your sound system being damaged. Best of all, most waterproof speakers are small, and you can easily mount them for added ease. They even come in different colors so you can customize them to the color of your ride. Dry bag: This is a must-have for jet skiing for a few reasons. A dry bag lets you store the important things like your cell phone, wallet, license, registration papers, and car keys in a safe place, but it also lets you pack a spare change of clothes and towel which will stay dry so you have something to wear other than your wet suit after a ride. You can find dry bags in several sizes to meet your needs and carrying capacity on your ski. Waterproof phone case: If you don’t want to carry a full-sized dry bag on your ride, at the very least you will need a waterproof phone case, preferably one you can wear around your neck. When you are out riding, accidents happen, and having a phone on you is important for communication purposes. A waterproof case lets you bring your phone without the added worry of water damage. Paddle: This is one of the most important accessories to have because it’s so useful. A small paddle is ideal for when you have mechanical issues, run out of gas, or are trying to move your vessel without power for any other number of reasons. These jet ski paddles are made to be compact and lightweight yet able to expand to make paddling easy and effective when you need to get to land. Jet ski anchor: As anyone familiar with skiing knows, the water will naturally move your machine around unless you anchor it when you are stopped. The best choice is a folding anchor because it is easy to use and takes up very little space, but there are also sand anchors and screw anchors on the market for those looking for a different choice. The key is to find the right weight for your machine weight. When buying this item, keep in mind the weight of the anchor and the weight of your machine to get the right one for your ride. Proper riding shoes: While some people choose to ride barefoot, proper riding shoes really are a must-have accessory for any jet skier. The boards can get slippery when wet which can make things more dangerous when mounting or dismounting the vehicle. Surrounding areas such as docks can also be pretty slippery so you need a bit more traction which riding shoes can offer. Riding boots are also a great choice when riding in colder water or during the official offseason to help you stay warm. Reboarding ladder: If you have ever tried to mount a jet ski from the water, you know how hard it can be to get back on your ride. From the sheer size of the machine and the weight of 500 pounds of jet ski toppling over on you to the fact of trying to pull yourself up out of the water which requires quite a bit of upper body strength, the use of a reboarding ladder has become a common choice. Whether you buy a ladder direct from the manufacturer or one you add on later, it’s a smart move to make getting back on a bit easier and safer. Jet ski lift: When looking for a way to safely and easily lift your 500 pounds or more jet ski from the water, a ski lift is one of the best accessories to invest in for any jet ski lover. This is a great way to move your ski as needed and ensure minimal damages to your ride. Best of all, they come in several options to meet a range of budgets.